Creative Christmas Entertaining Made Easy is the perfect mix of creative projects, recipes, ideas and advice. Featuring step-by-step craft guides, instructional videos and helpful printables, you’ll learn how to make gilded crockery, embellished napkins, floral arrangements, cocktails & mocktails, canapés and much more. It’s also full of down-to-earth advice that makes hosting easy. 1. Get prepared! The most you can do in advance the better. So, try to complete all household chores a day or so before. 2. Stock up! Do an online shop that’s timed to arrive when you need it to so you’re not rushing around. Don’t forget kitchen supplies, loo roll and bin bag! 3. Keep it simple! Complicated menus sound amazing but pile on the pressure. Keep it simple with my tried-and-tested recipes that everyone will love. 4. Cut down on washing up! 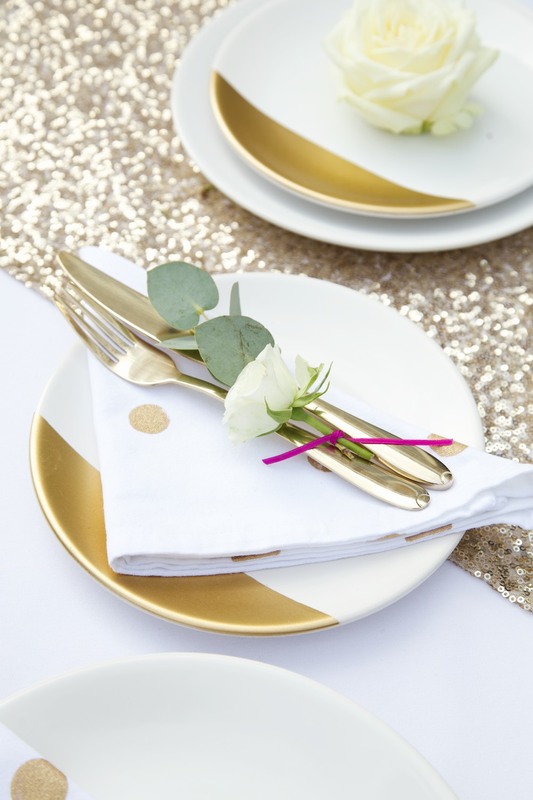 Place a little stack of cocktail napkins next to each plate of nibbles so you guests can use these rather than plates. Also, my killer one pot main course means your dishwasher won’t be struggling to cope! 5. Don’t pour drinks! Pouring endless drinks for guests will keep you busy when you could be having fun. Set up a drinks station with jugs of cocktails, plenty of ice and glasses on hand so guests can help themselves. 6. Lower the lighting! Bright light is a no-no so switch on those fairy lights on and use lots of candles to create a cosy, intimate feel. 7. Prep the playlist! Pull together your playlist before the event so you’ve got your sound track sorted in advance. Don’t forget, a few cheesy tunes will make everyone smile! 8. Start clean! Starting with a clean kitchen, clear counter tops and an empty dishwasher is a great idea. 9. Lay the table early! Do this well in advance so that if guests arrive early, you look like you’re ready for them even if you’re still in the kitchen. Follow the step-by-step instructions in Creative Christmas Entertaining Made Easy to make sure everything looks amazing or download Pudding Bridge’s Perfect Christmas Table guide. 10. Timers are your friend! Using timers alongside my two-hour countdown will mean that you don’t miss anything and you can serve your dinner on time and with a smile on your face. So, for the prettiest, easiest and most stress-free festive party, all you need is Creative Christmas Entertaining Made Easy. Creative Christmas Entertaining Made Easy is now available from the Groupon for just £16 - https://www.groupon.co.uk/deals/pudding-bridge. Course discount codes and giveaways are available – please contact tamrynlawrence@gmail.com for details and high res images. If you would like to review the course, please get in touch. Christmas craft kits and sequined table runners are available from Pudding Bridge’s Not On The High Street store. Pudding Bridge is an award winning wedding and event hire company owned and managed by Helen Hopkins. She has created her own range of innovative products that enable clients to transform any event into dazzling celebrations. From the fun and funky ‘Booth in a Box’ to the elegant and glamorous Sequin Collection, Pudding Bridge creates breathtakingly beautiful celebrations.